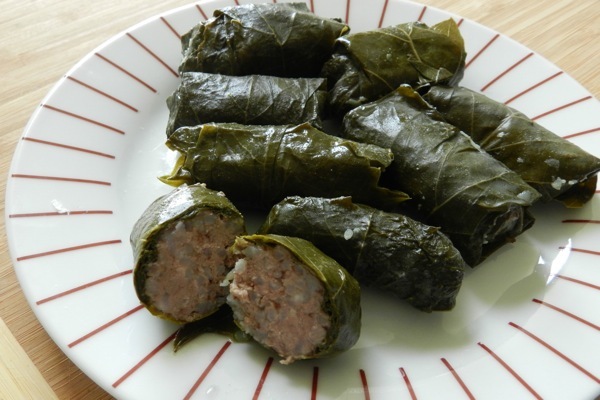 Dolmeh – stuffed grape leaves – have always been associated with Greek food for me. As it turns out, they’re a generally Middle Eastern dish, and there are multiple ways of making them depending on the country. With only a week left in Israel, my Israeli roommate Ruthy surprisingly showed up with supplies to make dolmeh, but in this case, Lebanese style. Depending on how many you’re planning to make, dolmeh aren’t hard but they can be time consuming. As amateur dolmeh makers, it took us some time with our first round, but with some practice we were able to pick up the pace a bit for our second batch! We made two types of dolmeh – some stuffed with a spiced meat and rice mixture, as well as a vegetarian version stuffed with rice. Both were delicious. And better yet, simple enough to make. What better way to bring back experiences from abroad than with food? Sarah McAnaw is a junior at American University where she studies International Studies and Biology. After cooking (and eating!) her way through a semester in Florence, Italy last fall, she’s spending the spring in Haifa, Israel studying the Arab-Israeli conflict and learning to cook authentic Middle Eastern food from her Israeli roommates. Note: Dolmeh are traditionally filled with ground lamb, but Ruthy used a mix of ground lamb and ground beef. Any type of ground meat could be used though. We also mixed the rice to the meat un-cooked, but you can cook the rice a bit and then add it to the meat if you would like. To prepare the meat mixture, add the spices and rice to the ground meat and mix until just incorporated. Be careful not to overmix, as this will cause the meat to become tough. Carefully extract the grape leaves from the jar, as you will want to tear the leaves as little as possible. Thoroughly rinse the grape leaves under cold water and pat dry. Take one grape leaf and place it shiny side down (veined side up) on your workspace; trim the stem if there is one. Take a small amount of meat mixture and roll it into a log shape about the length and width of your thumb. This measurement will be slightly more or less depending on the size of the leaf – the filling should ideally reach about ¾ of the way across the leaf, with room on the sides. Place the filling in the center of the leaf at its base. Starting at the bottom, roll the leaf up around the meat; fold in the sides and continue rolling and folding in the sides as you go (like so). You’ll want the leaf to be pretty tightly wrapped, but we careful not to tear the leaf. Place the fully wrapped dolmeh in a medium pot, seam side down. Repeat this process until all of the filling has been used up, placing the wrapped dolmeh snuggly side by side in the pot in concentric circles. The dolmeh should be securely fitted into the pot – you don’t want them floating up during the cooking process! Once the pot is filled – you want to have completely filled layers like in the photo above – place a plate that fully covers the dolmeh on top in the pot. If you run out of meat mixture and can’t have complete layer, make a small amount of rice to make enough extra dolmeh to fill in the spaces. Cover with water and olive oil. Simmer over medium heat for half an hour to 45 minutes, until the meat and rice have cooked through. Serve as an appetizer, side dish or truly Middle Eastern style, in big bowl as a meal all by itself! For vegetarian dolmeh, cook the rice until nearly but not completely cooked. Add spices and mix. As with the meat dolmeh, carefully take the grape leaves out of the jar and rinse under cold water. Pat dry. Once the rice is cool enough to handle, place a leaf shiny side down on your work space and trim the stem if there is one. Take a small amount of rice (measurements are the same for the rice as they are for the meat) and form into a log shape if possible. If it’s easier for you, place about a tablespoon of rice in the center of the leaf at its base and try to form it into a somewhat cohesive mound. 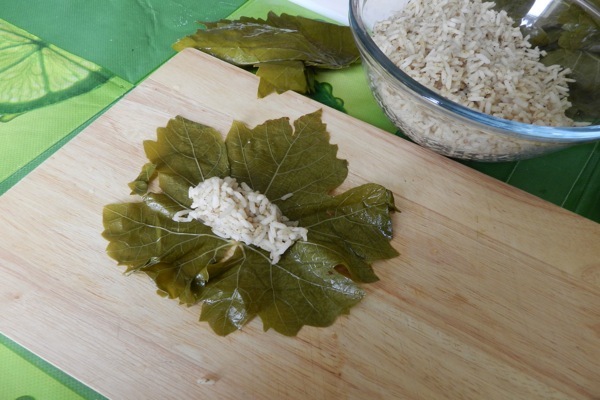 Roll the grape leaf up around the rice, tucking in the sides as you go. 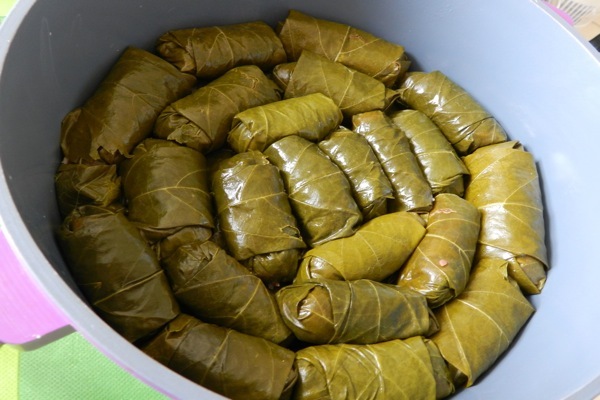 Place the rolled dolmeh in a medium sized pot, tightly packing them in concentric circles until the pot is finished or there are no more dolmeh to make. You want to have complete layers so that no dolmeh float during the cooking process and fall apart. Put a plate that fits into the pot on top and cover with water and olive oil. Cook for about 30 minutes, until the rice is fully cooked and heated through. Categories: Blog, Dinner Parties, Eating, Featured, Healthy Recipes, Recipes, and Travel. Mealtime: Dinner, Lunch, and Snacktime. I'm Cooking For...: Birthday, Dinner Party, Myself, Picnic, and Potluck. Type of Food: Finger Food & Dips, Meat, Sides, Vegan, and Vegetarian.